Slava Koulikov was only interested in talking about one team last night (February 14). 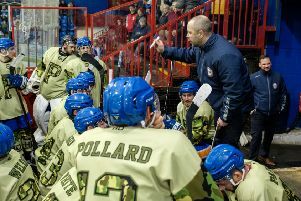 The Peterborough Phantoms coach could have been forgiven for publicly condemning the approach and actions of opponents Sheffield Steeldogs during the stormiest night of the English Premier League season at Planet Ice. But Koulikov didn’t deem the needless nonsense of the ill-disciplined visitors worthy of a mention as he instead opted to wax lyrical about the top-notch display of his own men. “I haven’t seen my team play as well as that for a long time,” insisted Koulikov following an 8-3 demolition job which earned a seventh victory in eight games for Phantoms. They’ve pocketed 15 out of a possible 16 points in that time to emerge as genuine title contenders, sitting four points behind pacesetters Basingstoke with a couple of games in hand. They were a class above their latest opponents who appeared only to be interested in picking fights. Brains over brawn springs to mind. Koulikov said: “We took control of the game, we were ready for everything and we dominated in every area of the ice as the scoreline shows. “It was so pleasing to see a performance like that at this stage of the season and I’m also delighted with another four-point weekend. Pride of place in that terrific Phantoms showing belonged to the excellent Ales Padelek, who helped himself to two hat-tricks in the same game. Not only did the Czech import find the twine on three occasions, he also laid on a trio of goals for team-mates as well. Obviously those contributions weren’t spotted for the people charged with the task of selecting the Phantoms man-of-the-match though. That honour instead went to defenceman-turned-forward Jason Buckman, who also added his name to the list of Phantoms scorers when enjoying an attacking outing on the third line. Buckman was only denied further goals by the pipes and the helmet of Steeldogs netminder Dalibor Sedlar. Milan Baranyk hit two of the other Phantoms goals to make it a hat-trick for the weekend after one in Bracknell the previous night. Darius Pliskauskas got to his own treble the other way with one effort against Sheffield to add to two in Berkshire. His seventh goal last night prompted the exit of Steeldogs goalie Sedlar with Thomas Barkworth taking over for the remaining chunk of the final period. Koulikov had also opted to change his netminder ahead of the third session with Adam Long replacing a clearly angered Janis Auzins. The Latvian ace had been on the receiving end of plenty of provocation from Sheffield and reacted furiously when Elliott left a stick in on him with 15 seconds of the middle period to go. That sparked the game’s major flashpoint with tempers flaring on both sides as Phantoms defenceman Greg Pick traded blows with Steeldogs enforcer Callum Pattison for the second time on the night. The two men had earlier clashed in the first period in an even contest with Pick getting the better of it when the fists flew again. Then, as a host of penalties were being distributed by referee Dan Boardman, chief Sheffield irritant Craig Elliott felt the need to goad Auzins again. Probably most disappointing of all was seeing Steeldogs player-coach Greg Wood collect a two-minute roughing penalty and a 10-minute misconduct at a time when he might have been better served attempting to control his players. It wasn’t so long ago that Phantoms could be found languishing in the EPL doldrums alongside the likes of Sheffield. How times have changed for the better thanks to Koulikov. Now they are a team really worth talking about. They will be out to continue their fine current form when entertaining Manchester on Wednesday (February 17, 7.45pm) – a night which sees leaders Basingstoke travel to third-placed Milton Keynes. A trip to Swindon on Saturday (February 20, 5.45pm) then follows ahead of a visit from reigning champions Telford on Sunday (February 21, 5.30pm).